My name is Ikyeelo Mataliwa and I am 7 years old. I live in DR Congo and need your help. Ikyeelo lives, with his 2 brothers and 4 sisters, very far away from his current school. He enjoys riding his bike but this is a great challenge for him to go to school every day. Sponsorship would allow him to attend the Linda Stryker Academy which is closer and will provide higher quality Christian education. 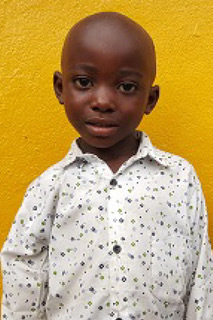 Open up Ikyeelo's future by sponsoring him today!